Approximate size comparison of a hypothetical superhabitable planet with Earth. Kepler-442b (also known by its Kepler object of interest designation KOI-4742.01) is a confirmed near-Earth-sized exoplanet, likely rocky, orbiting within the habitable zone of the K-type main-sequence star Kepler-442, about 1,206 light-years (370 parsecs), from Earth in the constellation Lyra. The planet was discovered by NASA's Kepler spacecraft using the transit method, in which the dimming effect that a planet causes as it crosses in front of its star is measured. NASA announced the confirmation of the exoplanet on 6 January 2015. Kepler-442b is a super-Earth, an exoplanet with a mass and radius bigger than that of Earth, but smaller than that of the ice giants Uranus and Neptune. It has an equilibrium temperature of 233 K (−40 °C; −40 °F). It has a radius of 1.34 R⊕. Because of its radius, it is likely to be a rocky planet with a solid surface. The mass of the exoplanet is estimated to be 2.34 M⊕. The surface gravity on Kepler-442b would be 30% stronger than that of Earth, assuming a rocky composition similar to that of Earth. The planet orbits a (K-type) star named Kepler-442. The star has a mass of 0.61 M☉ and a radius of 0.60 R☉. It has a temperature of 4402 K and is around 2.9 billion years old, with some uncertainty. In comparison, the Sun is 4.6 billion years old and has a temperature of 5778 K. The star is somewhat metal-poor, with a metallicity (Fe/H) of −0.37, or 42% of the solar amount. Its luminosity (L☉) is 11% that of the Sun. The star's apparent magnitude, or how bright it appears from Earth's perspective, is 14.97. Therefore, it is too dim to be seen with the naked eye. Kepler-442b orbits its host star with an orbital period of 112.3 days and an orbital radius of about 0.4 times that of Earth's (a little larger than the distance of Mercury from the Sun, which is about 0.38 AU). It receives about 70% of the sunlight that Earth receives from the Sun. The planet was announced as being located within the habitable zone of its star, a region where liquid water could exist on the surface of the planet. It was described as being one of the most Earth-like planets, in terms of size and temperature, yet found. It is outside of the zone (around 0.02 AU) where tidal forces from its host star would be enough to tidally lock it. As of July, 2018, Kepler-442b was considered the most-habitable non-tidally locked exoplanet discovered. K-type main-sequence stars are smaller than the Sun and live longer, remaining on the main sequence 15 to 30 billion years compared to the Sun's estimated 10 billion. Despite these properties, the small M-type and K-type stars can pose a threat to life. Because of their high stellar activity at the beginning of their lives, they emit strong solar winds. The duration of this period is inversely linked to the size of the star. However, because of the uncertainty of the age of Kepler-442, it is likely it may have passed this stage, making Kepler-442b potentially more suitable for habitability. Because it is closer to its star than Earth is to the Sun, the planet will probably rotate much more slowly than Earth; its day could be weeks or months long (see Tidal effects on rotation rate, axial tilt and orbit). This is reflected in its orbital distance, just outside of the point where the tidal interactions from its star would be strong enough to tidally lock it. Kepler-442b's axial tilt (obliquity) is likely very small, in which case it would not have tilt-induced seasons as Earth and Mars do. Its orbit is probably close to circular so it will also lack eccentricity-induced seasonal changes like those of Mars. One review essay in 2015 concluded that Kepler-442b, along with the exoplanets Kepler-186f and Kepler-62f, were likely the best candidates for being potentially habitable planets. In 2009, NASA's Kepler spacecraft was completing observing stars on its photometer, the instrument it uses to detect transit events, in which a planet crosses in front of and dims its host star for a brief and roughly regular period of time. In this last test, Kepler observed 7004500000000000000♠50000 stars in the Kepler Input Catalog, including Kepler-442; the preliminary light curves were sent to the Kepler science team for analysis, who chose obvious planetary companions from the bunch for follow-up at observatories. Observations for the potential exoplanet candidates took place between 13 May 2009 and 17 March 2012. After observing the respective transits, which for Kepler-442b occurred roughly every 113 days (its orbital period), it was eventually concluded that a planetary body was responsible for the periodic 113-day transits. The discovery, along with the notable planetary systems of the stars Kepler-438 and Kepler-440, were announced on 6 January 2015. At nearly 1,120 light-years (342 pc) distant, Kepler-442b is too remote and its star too far for current telescopes or the next generation of planned telescopes to determine its mass or whether it has an atmosphere. The Kepler spacecraft focused on a single small region of the sky but next-generation planet-hunting space telescopes, such as TESS and CHEOPS, will examine nearby stars throughout the sky. ^ a b c d e f g h Torres, Guillermo; Kipping, David M.; Fressin, Francois; Caldwell, Douglas A.; Twicken, Joseph D.; Ballard, Sarah; Batalha, Natalie M.; Bryson, Stephen T.; Ciardi, David R.; Henze, Christopher E.; Howell, Steve B.; Isaacson, Howard T.; Jenkins, Jon M.; Muirhead, Philip S.; Newton, Elisabeth R.; Petigura, Erik A.; Barclay, Thomas; Borucki, William J.; Crepp, Justin R.; Everett, Mark E.; Horch, Elliott P.; Howard, Andrew W.; Kolbl, Rea; Marcy, Geoffrey W.; McCauliff, Sean; Quintana, Elisa V. (2015). 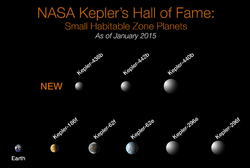 "Validation of Twelve Small Kepler Transiting Planets in the Habitable Zone". The Astrophysical Journal. 800 (2): 99. arXiv:1501.01101. Bibcode:2015ApJ...800...99T. doi:10.1088/0004-637X/800/2/99. ^ Staff (2015). "Planet Kepler-442 b". The Extrasolar Planets Encyclopaedia. Retrieved 11 January 2015. ^ a b "HEC: Data of Potential Habitable Worlds". ^ a b c d Sample, Ian (7 January 2015). "Kepler 438b: Most Earth-like planet ever discovered could be home for alien life". The Guardian. Retrieved 7 January 2015. ^ a b c d e f Clavin, Whitney; Chou, Felicia; Johnson, Michele (6 January 2015). "NASA's Kepler Marks 1,000th Exoplanet Discovery, Uncovers More Small Worlds in Habitable Zones". NASA. Retrieved 6 January 2015. ^ Gilster, Paul (6 January 2015). "AAS: 8 New Planets in Habitable Zone". Centauri-dreams.org. Retrieved 9 January 2015. ^ a b "Planetary Habitability Laboratory at University of Puerto Rico". ^ Extrapolated from the information given in "HEC: Data of Potentially Habitable Worlds - Planetary Habitability Laboratory @ UPR Arecibo". phl.upr.edu. Retrieved 15 September 2015. Using a planetary composition similar to earth. ^ "HEC: Data of Potentially Habitable Worlds - Planetary Habitability Laboratory @ UPR Arecibo". phl.upr.edu. Retrieved 19 March 2019. ^ Fraser Cain (4 February 2009). "Star Main Sequence". Universe Today. Retrieved 4 October 2015. ^ "Red Dwarf Stars May Be Best Chance for Habitable Alien Planets". Space.com. Retrieved 4 October 2015. ^ "Can Life Thrive Around a Red Dwarf Star?". Space.com. Retrieved 4 October 2015. ^ Paul Gilster, Andrew LePage (30 January 2015). "A Review of the Best Habitable Planet Candidates". Centauri Dreams, Tau Zero Foundation. Retrieved 24 July 2015. ^ Siemion, Andrew P.V. ; Demorest, Paul; Korpela, Eric; Maddalena, Ron J.; Werthimer, Dan; Cobb, Jeff; Langston, Glen; Lebofsky, Matt; Marcy, Geoffrey W.; Tarter, Jill (3 February 2013). "A 1.1 to 1.9 GHz SETI Survey of the Kepler Field: I. A Search for Narrow-band Emission from Select Targets". Astrophysical Journal. 767 (1): 94. arXiv:1302.0845. Bibcode:2013ApJ...767...94S. doi:10.1088/0004-637X/767/1/94. Wikimedia Commons has media related to Kepler-442b. NASA – Kepler-442b at The NASA Exoplanet Archive. NASA – Kepler-442b at Extrasolar Planets Encyclopaedia. This page was last edited on 30 March 2019, at 18:41 (UTC).